It”s not very often I make lamb out of the blue but a few weeks ago it seemed the perfect time to pull a rack of lamb chops from the freezer and slow roast them. I had received a package from Superior Farms a little while ago but hadn’t had a chance to cook with it yet. We slaughter a sheep yearly for Eid however I’m the one that ends up butchering it (not pretty). It was a big change of pace to open up a package that is cleaned and ready to go! Many people are very intimidated by lamb, thinking it’s hard to cook – it’s not hard to cook this way. This week is my first week participating in #SundaySupper an online cooking event focused on bringing families back around the table. I can’t think of a better dish than this to gather your family around. This week’s theme is Dishes in 5 Ingredients of Less (with salt, pepper, and water being freebie ingredients), believe it or not this can be done with those parameters. 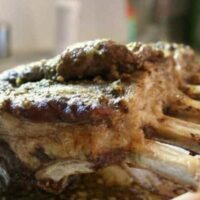 Making lamb chops has never been easier than with this recipe. 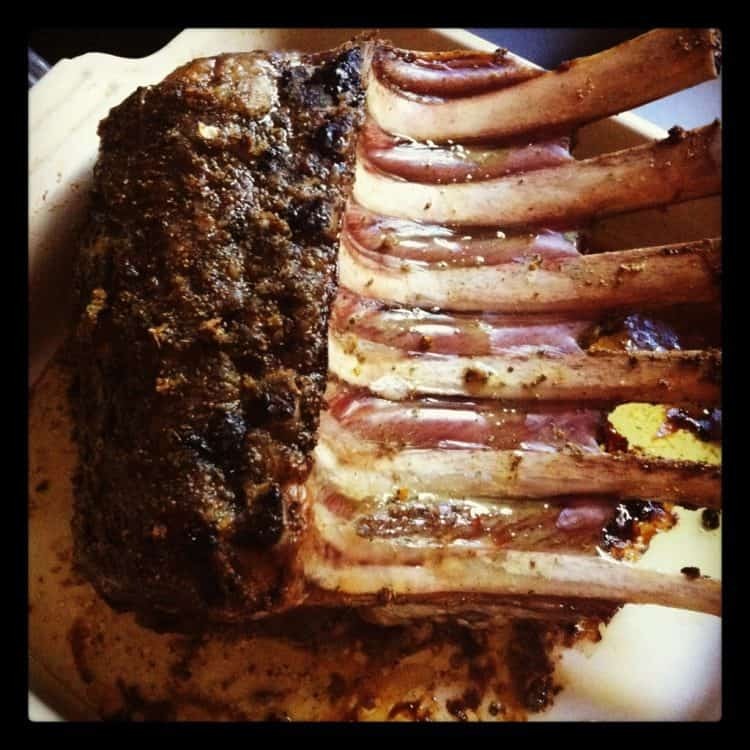 **If possible purchase or ask your butcher to "French" your lamb ribs - this will remove the fat and stringy parts of the upper tips of the lamb. In a bowl mix the ginger, garlic, salt, pepper and cumin in a bowl. You can add more or less depending on the size of your lamb. To prepare your lamb, remove the back fat from roast. You don't want to remove all of the fat but there may appear to be a "sheet" of fat on one side, this can be removed. Use a fork to poke the meat so that the marinade can get into the meat. Rub the entire roast with the marinade until it is coated. Place into a roasting pan double the size of the lamb. If possible allow to marinade for at least 1 hour but up to overnight. When ready to cook, preheat the oven to 300F. Slide the lamb in and allow to roast for 2 hours. After this time check the lamb, there should be a good deal of fat liquified at the bottom. Cut, clean and prepare your potatoes and place all around the lamb and mix with the juices that have released. Continue cooking for 30-45 minutes and test the potatoes, continuing to cook if they are not cooked through. The internal temperature of the lamb should be 160F for medium ad 165F for well done. This roast will not be pink but completely cooked through. Don't worry about it being tough - it will fall apart when you're eating it. To serve, cut 1-2 ribs off and plate with potatoes and a drizzle of pan juices if desired. The lamb completely cooked and delicious! Want more easy Moroccan recipes? I’ve got a bunch! Click the link! Who knew such an elegant, exotic meal could be made with 5 ingredients? Beautifully done! Happy first #SundaySupper! I absolutely love lamb, probably because I rarely have it. It’s a nice treat for me when I do buy it. I’ll have to keep this recipe in mind! this Lamb looks amazing!!! Love this! I love lamb and this sounds so good. I’m so glad to have found your website! I love Moroccan food and the cuisine from that region. Looking forward to checking out your recipes! Welcome to Sunday Supper. I would love to try this on beef. 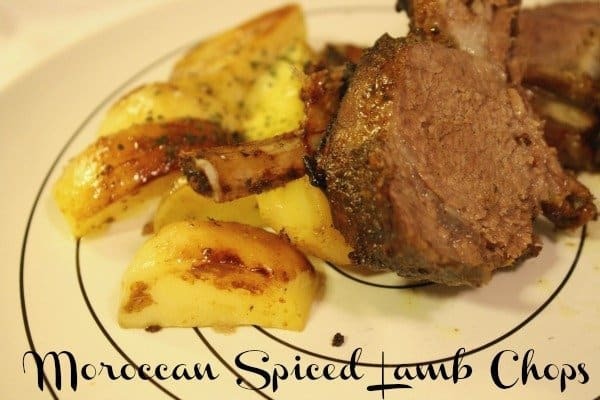 We don’t eat lamb but I bet this recipe would go great with other meats. Great photos. It would work well with beef too! I’m so impressed that you butcher your own lamb. I’ve never been a huge lamb fan, but I had some when I was in New Zealand that was to die for. Thanks for inspiring me to try cooking it myself! Trust me the first time it was pretty terrible – I had no idea what I was doing!! I am personally not a fan of lamb, but my mother is. I sent this recipe to her and I know she will be enjoying it soon. Thank you! Nicely done, looks like a beautiful rack of lamb!! Wonderful recipe and picture! Thanks for sharing with us! I don’t think I have ever made lamb at home. This looks wonderful, and easier than I thought it would be! 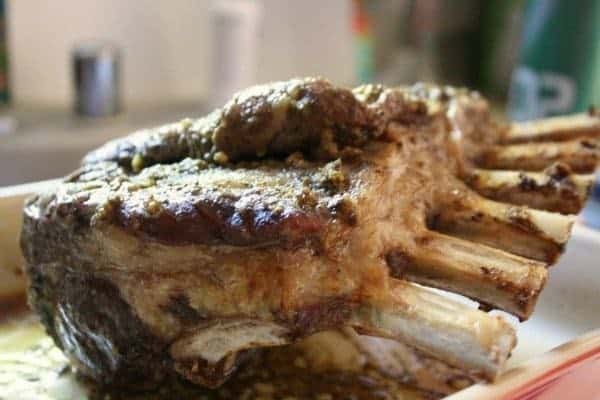 I’ve never made a rack of lamb– just a roast drizzled with red wine and stuffed with garlic and fresh rosemary, so this is definitely going on my Passover menu this year. And butcher your own goat? You amaze me! (although there is something very powerful about knowing where your food came from- brings a whole new level of thankfulness that most of us cannot even fathom) So glad that you’re part of #SundaySupper, and I can’t wait to see more in the future! I’m sending this to my step-mom she LOVES lamb! Thank you for sharing! You butcher your own lamb? Wow… I love lamb, and this is a new flavor combination. Wonderful! Have a great sunday! Yes I do but it’s not a pretty sight!